Hope Fest happens annually and this year we are joining forces with them to serve Tucson. We are using this opportunity to SHOW people who Jesus is by meeting them literally where they are rather than waiting for them to come to us. For this reason, we are not having services here at Vision Church for this weekend. Our hope and prayer is that you will also go out into the community and BE the church for someone. We can pretty much guarantee that you'll leave with a story of how God moved that day. 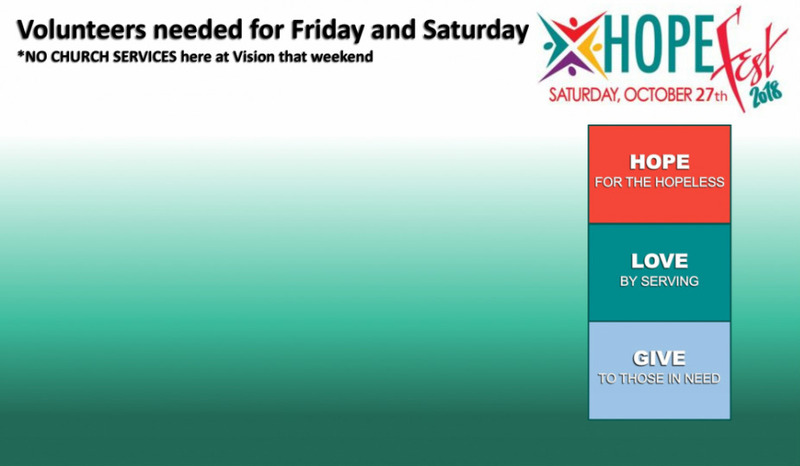 If you'd like to sign up to volunteer, please email Teri Webb at teri.thevisiochurch@gmail.com and if you're looking for details for that day, click here to see them! We hope you'll join us for Hope Fest weekend!